1. Flapper Type Sight Glass : Used for observing the state of fluid flow depending on opening & closing of the flapper on fluid flow. 2. Ball Type Sight Glass : Used for observing the fluid flow of common flow velocity by the motion of balls within the screen. 3. Ring Ball Type Sight Glass : Used for observing the fluid flow with rapid flow velocity by the motion of balls within the rigid ring. 4. 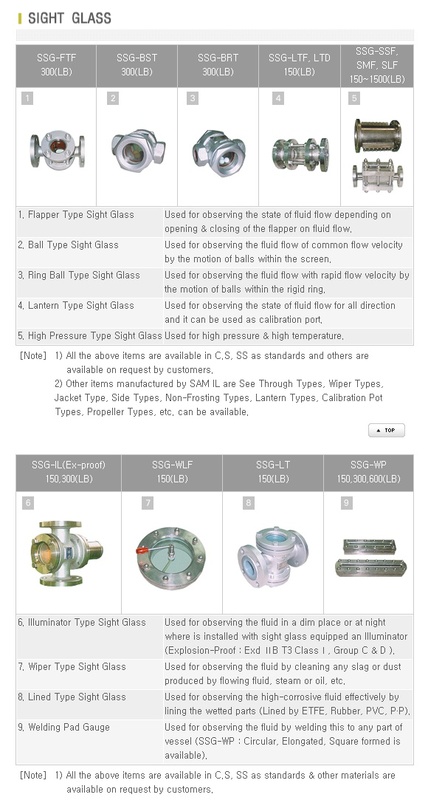 Lantern Type Sight Glass : Used for observing the state of fluid flow for all direction and it can be used as calibration port. 5. High Pressure Type Sight Glass : Used for high pressure & high temperature.